Vocational education is the subject of a major government review but Michael Gove has already given the go-ahead to one new model for 14-19s. Daniel Cremin explains the genesis of the ‘university technical college’ and examines the initiative’s aims and ambitions. Education Secretary Michael Gove chose his first major speech after the summer break to announce the launch of a major independent review of vocational education for 14-19 year olds. Led by Professor Alison Wolf, a national skills policy expert, it will appraise the overall effectiveness of the current vocational offer in both schools and colleges and make recommendations on how to inject more innovation and flexibility into the system in terms of funding mechanisms, institutional arrangements, and specialised progression routes into higher education and higher-level training. One model Mr Gove is already backing is a new generation of technical schools, or university technical colleges (UTCs). Alongside the academy conversion agenda and free schools, UTCs represent a third element of his radical school reform programme. UTCs are the brainchild of the Baker-Dearing Educational Trust, established in 2007 by the former education secretary Lord Baker and the late Sir Ron Dearing, a noted industrialist who led a number of influential education policy reviews. Both felt that one of the great blunders of English education reform during the post-war period was the disappearance of 172 technical schools in the comprehensive surge of the 1950s. Lord Baker links their demise to a combination of under-investment and “good old British snobbery”. The key problem he recalls “was that everyone wanted to be in the school on the hill and the technical schools were considered to be for dirty jobs and greasy rags”. UTCs are a sub-category of the academies programme. Their goal, says Lord Baker, is to bring “the education of the mind and the training of the hand” under one roof, in hi-tech settings, for students who from the age of 14 want to pursue technical learning. “What our UTCs will deliver is a high-quality alternative pathway of success, which is different from the traditional academic route of three A levels and university, but nonetheless of equal value,” he adds. However some critics have argued that creating UTCs may entrench further the academic/vocational divide. Sally Hunt, the general secretary of the University and College Union has said that they potentially represent “a new ‘14-plus’ where students, typically from working-class backgrounds, are channelled into vocational subjects while their wealthier contemporaries are encouraged to pursue academic paths”. But Lord Baker says: “People always ask me how children are going to be selected for these. I say they’ll self-select, because by 14 they broadly know what they are interested in”. Peter Mitchell, chief executive at Lord Baker’s trust, also points out that universities and employers who get involved in creating a UTC must agree to a fundamental policy of not “pre-judging students on their past performance”. Jim Wade, principal of the £22m JCB Academy in Rocester, Staffordshire which opened in September 2010 as the first UTC in England, backs up this view. He says: “We have been very clear to other schools and the local authority that we are very willing to cater for young people with multiple levels of ability and we certainly won’t be trying to cherry-pick the best and leave the rest”. Lord Baker believes a crucial difference that will make UTCs more publicly attractive than the post-war technical schools is the explicit link of the academy to a university which will act as the lead or co-sponsor. This, he argues, will lift their status in the eyes of the students, parents and the wider business community. Professor Alison Halstead, the Pro-Vice Chancellor of Aston University, is leading efforts to open another UTC, the £17m Aston University Engineering Academy in Birmingham in September 2012. She stresses that the involvement of her university runs much deeper than simply lending their brand and equipment to the school. “What attracted us was the opportunity to pioneer a seamless, industry-oriented curriculum that brings a great variety of technologies and engineering disciplines to life for young people in imaginative ways and help prepare the highly skilled generation of engineers and technicians our city and region need,” she says. Professor Halstead says that Sir Mike Tomlinson, a trustee of the Baker-Dearing Educational Trust, is playing an active role in developing a thematic, joined-up curriculum, which she feels will be quite close to the integration of knowledge and skills he was aiming for with the 14-19 diploma framework he designed in 2004. “We will have a focused diet of provision, with extensive scope for personalisation, that fuses what they are doing in their practical diploma lessons or apprenticeship placement with what they learn in the English, maths, science and even German or Mandarin subjects they may be taking at GCSE or A level,” she said. At JCB Academy, both the Higher and Advanced Diplomas in Engineering and Business are structured so that students work on multiple projects or ‘challenge activities’, designed and supported by leading employers and university partners. 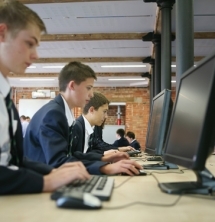 So while year 10 engineering students might initially work on a challenge to design remote control off-road vehicles with Harper Adams University College, over four years they may go on to design transmission systems for National Grid or sensor-based level crossing control grids for Network Rail. As well as the link with Harper Adams, Jim Wade highlights the importance of the JCB Academy’s extensive formal partnerships with universities such as Warwick, Cambridge, Derby and Staffordshire. They all feed into curriculum design and host groups of students for a day or longer. Given that the intake of UTCs will depend on transition from other secondary schools the quality of relationships with the wider family of schools is crucial. At Aston UTC, Professor Halstead has been pleased by the willingness of other schools to engage and contends that its UTC won’t be a go-it-alone operator: “We will share our expertise and facilities with other schools and FE colleges to help boost the quality of technical education across the board”. A number of FE colleges are already actively involved in the UTC programme as either co-lead sponsors or collaborative education partners. A prime example is Walsall College which, with the support of Wolverhampton University, is leading the development of the Black Country University Technical College. One of the key advantages the UTCs have enjoyed to date is genuine cross-party support. Lord Adonis, architect of Labour’s school reform programme, was extremely receptive to the UTC model and successive Labour schools ministers backed Lord Baker’s efforts both publicly and privately. A specific commitment was made in the coalition agreement to support a new generation of technical academies as part of efforts to diversify school provision. Michael Gove has described UTCs as a “fantastic innovation” that “ticks all the right boxes”. Yet the government has only signed up to create 12 UTCs so far. And, given the wider context of the coalition’s emphasis on developing smaller free schools, the phasing out of Building Schools for the Future and growing waiting lists for school maintenance work, some doubt whether the model will grow beyond what Mr Gove has termed “a Baker’s dozen”. It’s a mistake to assume the UTC concept automatically hinges on gleaming new £30 million building schemes, insists Peter Mitchell. “We recognise that as capital spending is wholly different from two to three years ago, we have to cut our cloth accordingly”. The trust believes that future UTCs could be located in business or technology parks, remodelled school sites or industrial premises to create high-tech inspirational learning environments. Lord Baker himself believes that there is strong potential for growth and would like the government to support the development of a network of around 100 UTCs across England in the next four to five years. Only time will tell whether this radical new pathway in our 14-19 system will send technical education in England back to the future or the UTC pioneers back to the drawing board. Daniel Cremin is ASCL’s adviser for public policy and stakeholder engagement and works for for Bellenden Public Affairs. UTCs are a sub-category of sponsor-led school within the academies programme. They have a high degree of freedom over the curriculum, workforce recruitment, timetables and term dates. They are normally sponsored by a local university plus at least one employer. They will recruit students from 14 onwards and focus on disciplines that require specialised training, technology and equipment such as engineering, advanced manufacturing and product design, health services, construction and the building trades, and land and environmental services. offer integrated education and apprenticeship programmes for 14-19 year olds through Higher and Advanced Diploma routes, young apprenticeships and level 3 apprenticeships. have 500-800 students on roll and an agreement with local authorities which allows them to admit students from other schools and colleges. work with leading universities and employers to design the curriculum around completing real world projects and bring in experts from industry to train and instruct. require students to take GCSE English, maths, at least two science options, ICT and a modern foreign language. not offer humanities or social sciences as 14-16 or post-16 qualifications.